What is the best time to study? 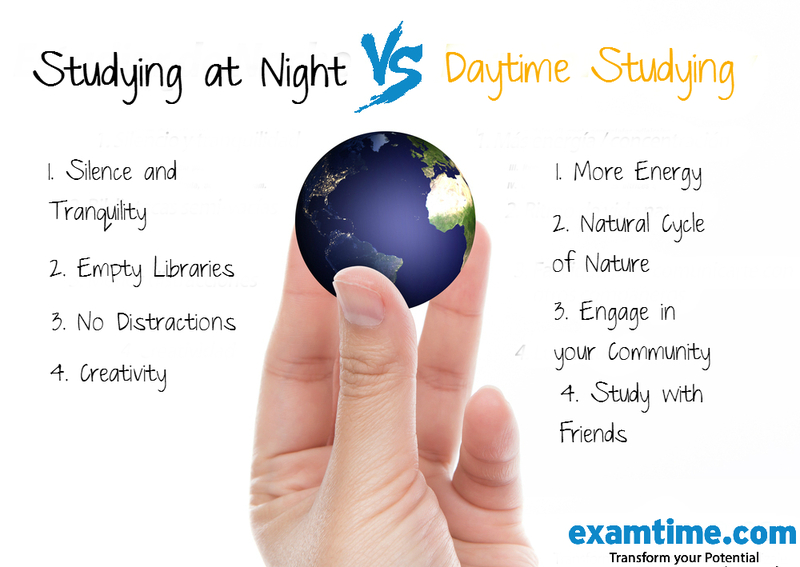 It�s one of those endless debates among students; is it better to study at night or during the day? Each side has its own loyal advocates who will speak at length of the benefits of their preferred method to try and convince you of the benefits of their choice. Everyone thinks they know what the best time to study is but the reality is that each person is different and there is no clear winner from a scientific point of view. There are some people who get more out of studying at night while others find the best time to study to be the morning or the afternoon. In terms of objective reasons for both sides, we�ve researched the following benefits to try and answer once and for all what is the best time to study?! 1. After a good nights sleep, you�ll likely have more energy and a higher ability to concentrate the next day. 3. Most people are contactable during the day so it�s easier to communicate with your friends or teachers during the day if you have any questions. 1. People are more active, louder and intense during the day. At night it�s only you and the night owls so you can study in peace and quiet. 2. If you�re lucky enough to live near a library that�s open late, you will notice that the library is near deserted when you want to study late. There are possibly more reasons why each of these options could be the best time to study. It�s important to note however that ultimately it all depends on your individual preferences. Sadly, there really is no objective �best time to study�! It all depends on your personality, what you�re studying, your resources, time management and your natural sleep cycle. If you study at night, or are interested in starting, then read the tips below. 1. Establish a Routine: If you decide to study at night, don�t do it sporadically, establish a study routine. This way your body will get used to it and you can get the best study performance possible. If you study for a few days and a few nights, your body will go crazy! Pick one and stick with it. 2. Rest: If you study at night, this does not mean you should be sleeping less. A well rested mind is key to successful study so make sure you don�t neglect your sleep by catching a few zzz�s during the day. 3. Lighting: It can happen to us all; you start studying during the evening and next thing you know it�s night time and you�re studying in the dark! Make sure this doesn�t become a common occurrence. If you�re a night studier, work in a properly lit room as it will improve your study. 4. Time Management: It�s easy to lose track of time when studying at night. This makes it even more important to create a study timetable outlining when you will take breaks. It�s recommended that you take a 5 to 10 minute break every 50 minutes when studying. Also make sure you keep hydrated! 5. Music: As mentioned above, one of the benefits of studying at night is the increase in your creativity levels. Many believe that their creativity becomes more pronounced at night. That is why many artists work through the night. A good idea to induce your creativity is to study while listening to music that inspires and motivates you. 6. Organise a Study Group: Studying in the dead of night lacks a lot of the social aspects that daytime studying may have. With this in mind, it may be a good idea to organise a study group with other night studiers to help you keep motivated. If you�re a night studier, why do you think this is the best time to study?